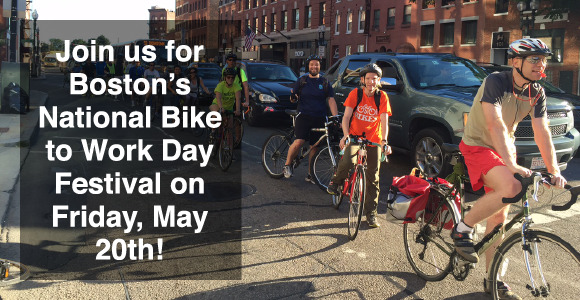 Join us for Boston's National Bike to Work Day Festival (formerly known as Boston's Bike Week Festival) on Friday, May 20th! Pedal over to City Hall Plaza, with a convoy or on your own, and you'll be greeted with free breakfast and a festival full of bike-friendly exhibitors. New this year - we'll be giving out free limited edition Boston Bikes t-shirts. Be sure to complete the free registration so that we can ensure we have enough food and shirts for everyone!